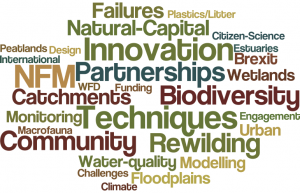 You want to make a difference in the field of river restoration and environmental management? Working in the UK and Europe at the interface between science and practice, the River Restoration Centre (UK) is seeking a Science and Technical Officer to lead our involvement in a Citizen Science EU Horizon 2020 project and to participate in the development of tools and techniques for river restoration. by Naura, M. & Hornby D. D.
How do you choose survey sites for river characterisation? In short, it all depends on your overall aims. The sites chosen for the River Habitat Survey (RHS) baseline surveys in 1994-6 and 2007-8 were originally identified from Ordnance Survey1:50,000 Landranger maps using a stratified sampling strategy using a 10km grid. The aim was to get a representative picture of river habitats across England and Wales. The stratification was introduced to provide a sample that could also be used to characterise smaller geographical units such as river basins or catchments. Random sampling strategies without stratification may indeed produce clusters of sites in parts of the country and leave some areas unsampled. In the end, 3 RHS site locations were randomly selected within every 10km-square in England, Wales and Scotland. Stratification can be performed according to a geographical area (e.g. squares or catchment boundaries), a river type or stream orders. It all depends on your specific reasons for introducing a stratum in your sample. If your aim is to compare the distribution of features across river types, you may want to stratify according to a set typology or stream orders. If your aim is to compare counties or states, then state or county boundaries may be used to stratify your sample. You need to remember that you need to account for the effect of stratifying your sample when analysing the data. For example, a geographical stratification using squares (e.g RHS baseline surveys) may introduce a bias when analysing the overall sample as a whole as it gives more weight to squares with low stream densities. If, following survey, you find that 80% of your sites are heavily modified, it could be wrong to state that 80% of rivers in your geographical area are modified because unmodified streams in upland and headwaters squares will be under-represented compared to modified streams in lowland squares. You would need to correct your statistics using stream densities for each square. There are other methods for sampling. One is to select sites at regular intervals (e.g. every 2km along the network from source to sea). Regular samples generate unbiased statistics as long as the chosen sampling interval does not correspond to the ‘wave length’ of the features you want to record. For example, the distribution of features such as riffles is a function of channel bankfull width. Now imagine that a specific habitat feature tend to occur every 2000m. Depending on your starting point, a 2km regular sampling strategies may completely miss the feature out. It is therefore important to make sure that the interval between survey sites does not correspond to the interval of occurrence of features you want to record. When we put together the first RHS baseline survey in 1994, site selection was done by hand. This required quite a bit of work by a team of people who had to select every site using paper maps and random number tables (for more details click here). The method used for stratification itself introduced some bias. Indeed, sites were selected in every 10km-squares by further dividing them into 2km-squares. A 2km-square would then be chosen at random and the point on the river closest to the centre of the square would represent the midpoint of the RHS site. This selection method meant that large rivers were more likely to be selected than narrower ones potentially introducing a bias based on river width. Geographical Information System (GIS) can help automate the identification of suitable river survey sites and reduce sampling bias. 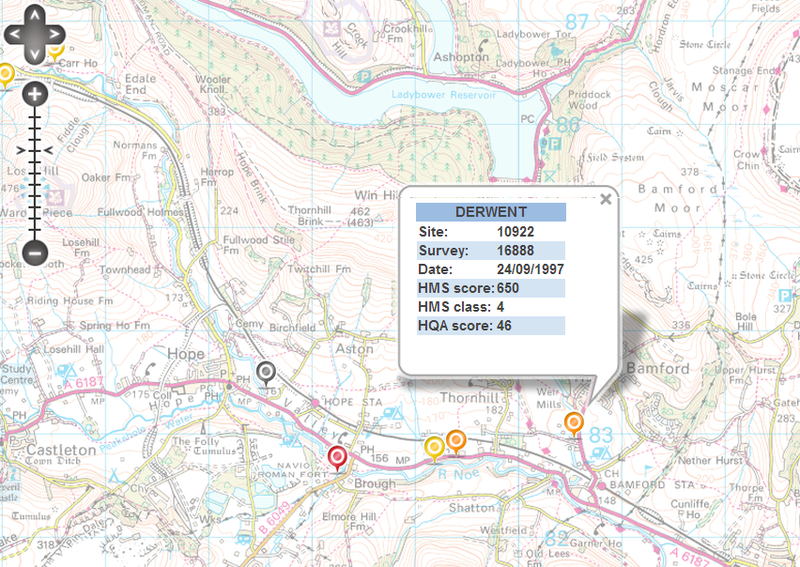 GIS can save significant time and money; reducing an intensive manual process which requires a team of people, to an individual pressing a button and obtaining a selection of sites within minutes! GIS selection is not bias free though! I have seen algorithms implementing ‘random’ samples by randomly selecting polylines in a river network. Because polylines will be of different lengths, the sample obtained is likely to be biased towards small polylines (e.g. 1m) that will be over-represented in the network compared to longer ones (e.g. 10km). To generate random samples for my research, I used RivEX which is an ArcGIS 10.1 AddIn that can automate the sampling of river networks. Provided you possess a valid network (a topologically correct centreline network), you can generate sampling locations using random or regular sampling strategies in RivEX. ● answer network tracing problems such as identifying the nearest site downstream or upstream. The tool is scalable allowing you to generate sampling points at a national, regional or sub-catchment level. 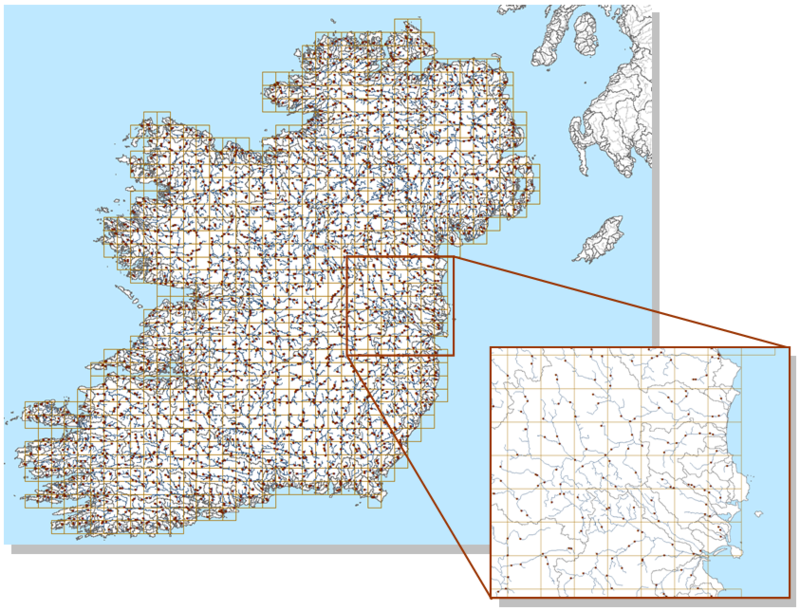 Figure 1 demonstrates stratified sampling using CCM data for Ireland. A 10Km grid is built and each cell sampled 3 times, the entire process took only 30 seconds! Figure 1. Stratified sampling of rivers in Ireland. RivEX was used to generate a 10Km grid and sampled each cell 3 times. CCM River and Catchment Database © European Commission – JRC, 2007. With RivEX you can generate regularly spaced sampling points at a user specified distance from the network mouth. Figure 2 show the river Shannon in Ireland sampled every 10Km. Such a dataset would be vital for a walk over campaign allowing your field surveyors to survey the river at known coordinates. I personally used this very useful function to extract GIS data for typing rivers and implementing predictive models. Figure 2. Regular sampling of the main stem of the river Shannon, Ireland, with a stepping distance of 10Km. CCM River and Catchment Database © European Commission – JRC, 2007. Defining a sampling strategy is a very important first step in any project aimed at characterising a river catchment or area. The choice of sampling strategy, method and intensity as well as the tool used are crucial and require careful consideration with regards to potential biases introduced. Tools exist that can help with automate the procedures and reduce bias. 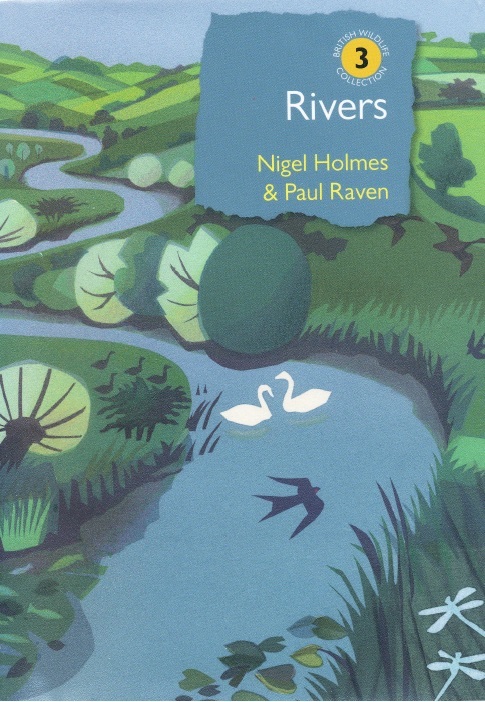 It was quite obvious early on in the development of RHS, and confirmed by results from the first baseline survey during 1994-97, that the UK had insufficient near-natural river channels to provide a reasonable calibration of habitat quality assessment. The ‘top quality’ benchmark sites surveyed in the UK simply didn’t do the job to cover the range of river types. So we looked to continental Europe, not only for near-natural examples, but also to see if RHS worked there. We also wanted to RHS on as wide a range of rivers as possible as part of development of the CEN guidance standard for assessing the hydromorphological character of rivers (Boon et al., 2010). It was colleagues on the CEN working group that provided the initial network of contacts. The first phase involved comparison of different methods for assessing river morphology that were either already in use, or being developed across Europe. A very informative meeting to compare ideas and demonstrate techniques on the nearby river was held in Galloway, SW Scotland in 1998. It became apparent that even though the various methods all made use of similar river features and artificial modification categories, there was considerable variation in the ways these were recorded and how the information was used to evaluate channel form and habitat quality. For RHS development, there were valuable lessons to be learnt by testing it across different bio-geographical regions, hydrological conditions and land-use patterns. From a UK perspective, the RHS method appeared to be sound, but if it was to be used elsewhere, specific testing would be needed and adaptations recommended in the light of experience. It was a great advantage that RHS was being used for the STAR project, involving several different European countries (Furse et al., 2006). Also, that a southern European version of RHS was being developed, specifically adapted for Mediterranean rivers (Buffagni & Kemp, 2002). The second phase involved a specific comparison between RHS, the German LAWA method and the then French method SEQ. 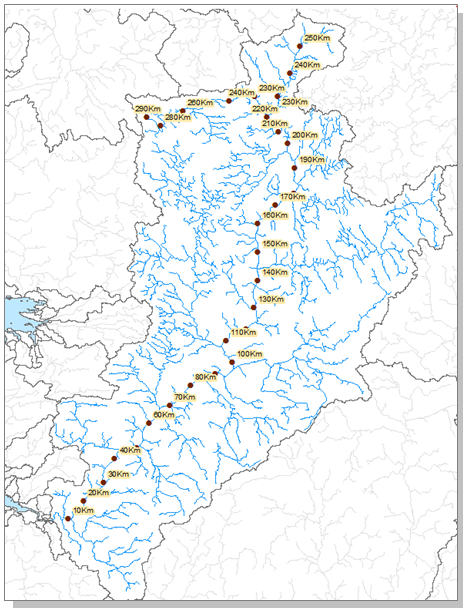 Rivers in France and the Pyrenees were surveyed by Patrick Charrier using all three methods. 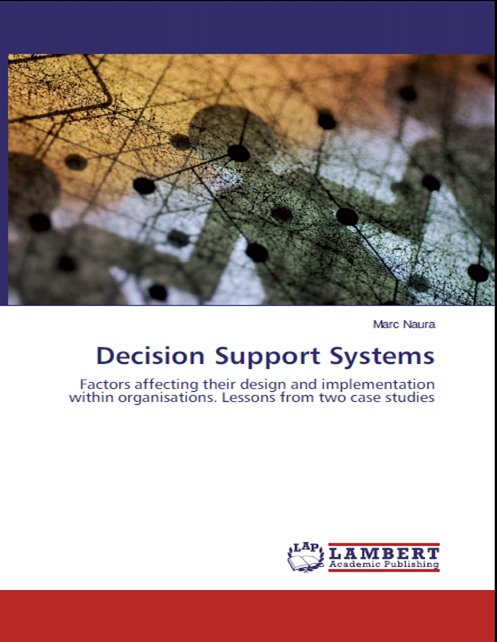 The work highlighted similarities and differences in approach, ease of use, analysis and conclusions. The conclusions and recommendations were discussed by the CEN workgroup in 2001 and published in 2002 (Raven et al., 2002). The third phase involved the long overdue review and updating the 1997 RHS survey form. We took the opportunity to test it and testing it on rivers during our second visit to Finland, in June 2002, including streams inside the Arctic Circle. It was here that two mantras, relevant to all subsequent benchmarking surveys emerged: “always expect the unexpected”; and “never underestimate the importance of local knowledge”. We had encountered something unfamiliar to us in the UK; the forestry practice of removing boulders from the river channel so that felled tree trucks could be floated downstream to sawmills. The benefits of these benchmarking surveys have been immense. We have established contact with those involved in similar work for the Water Framework Directive and river conservation right across Europe. We have had direct experience of carrying out surveys with host colleagues and being able to explain reasons for RHS and how it can be adapted and improved for use elsewhere. We have accumulated masses of new information about different rivers and how they have been affected by historical land-use change. 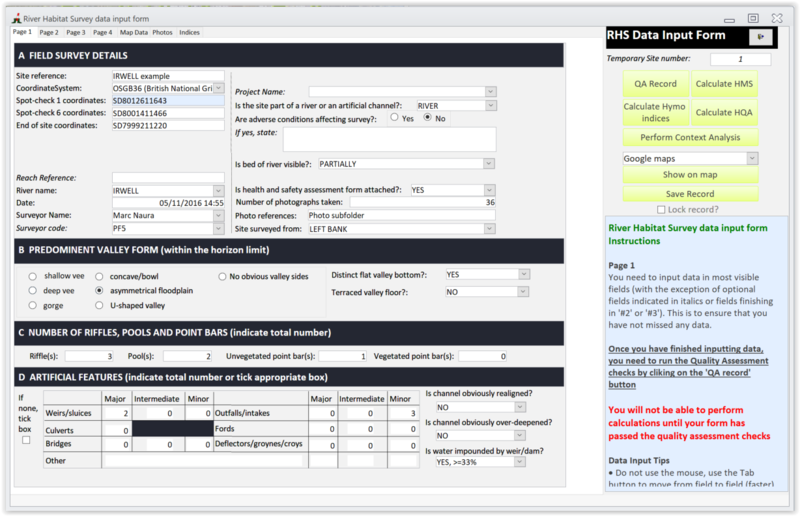 Through this website we will in due course be able to share RHS data on all our benchmark surveys, enabling users across Europe to see what was done, problems encountered and recommendations made. The recommendations be collated and a discussion group established to help improve survey technique and confidence in recognising unusual features in particular. We hope this leads to improved design and use of RHS and its integration with other survey work for river management and conservation purposes as well as well as academic research. This resource will consolidate progress made over the past 10-15 years and inspire others to take a broader outlook on river assessment. Boon PJ, Holmes NTH, Raven PJ. 2010. Developing Standard Approaches for Recording and Assessing River Hydromorphology: The Role of the European Committee for Standardization (CEN). Aquatic Conservation:Marine and Freshwater Ecosystems 20: S55-S61. Buffagni A, Kemp JL. 2002. Looking beyond the shores of the United Kingdom: addenda for the application of River Hbaitat Survey in South-European rivers. Journal of Limnology 61: 199-214. Raven PJ, Holmes NTH, Charrier P, Dawson FH, Naura M, Boon PJ. 2002. Towards a Harmonized Assessment of Rivers in Europe: a Qualitative Comparison of Three Survey Methods. Aquatic Conservation:Marine and Freshwater Ecosystems 12: 405-424. Raven PJ, Holmes NTH, Vaughan IP, Dawson FH, Scarlett P. 2010. Benchmarking Habitat Quality: ObservationsUsingRiver habitat Survey on Near-Natural Streams and Rivers in Northern and Western Europe. Aquatic Conservation:Marine and Freshwater Ecosystems 20: S13-S30.